The Made in Shropshire group came into existence in August 2005. The original concept for a Made in Shropshire brand came from Sarah Franklin of Women in Rural Enterprise (WiRE) who had a vision of a shop dedicated to selling arts and crafts designed, and created locally. 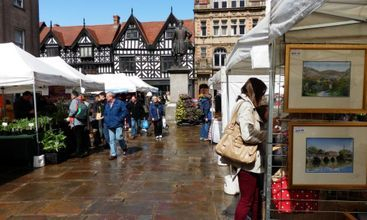 Following a meeting with Victoria Jones, Shropshire Rural Hub, in July 2005, and after a few telephone calls had been exchanged between the Hub Chairman and his contacts, the suggestion was made that we hold a monthly market in The Square, Shrewsbury. An open meeting was held on 18 August 2005 at which there were 30 local producers, it was decided unanimously to give the monthly markets a try and thus on 23 September 2005, the first Made in Shropshire market was held. 31 months later, and with the inclusion of food producers too, the markets continue and the group has evolved; forming its own management committee and becoming a formal membership organisation in May 2007. Membership currently stands at 60 and over 100 small, local businesses have been given the opportunity to showcase their goods in a prime retail location over the last few years. Made in Shropshire is often invited to take part in other events around the County too. The Group has benefited from the generosity of local accountants Whittingham Riddell, the Shrewsbury Branch of NFU Mutual, Shropshire County Council and Shrewsbury & Atcham Borough Council.